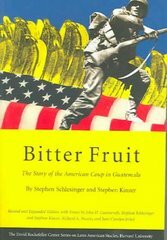 Bitter Fruit 2 Edition Bitter Fruit is a comprehensive and insightful account of the CIA operation to overthrow the democratically elected government of Jacobo Arbenz of Guatemala in 1954. First published in 1982, this book has become a classic, a textbook case of the relationship between the United States and the Third World. The authors make extensive use of U.S. government documents and interviews with former CIA and other officials. It is a warning of what happens when the United States abuses its power.